UC Santa Cruz continues to grasp at prestige as a research university, but has largely neglected research’s counterpart — teaching. In the 2013-14 academic year, a group of 55 individuals formed the Planning Task Force (PTF) to brainstorm what would become “Envision UCSC,” a strategic plan for the future of UCSC that highlights six goals: academic planning, research infrastructure, student success, staff engagement, identity and reputation and balanced operations. Despite the fact that 55 percent of the PTF is composed of faculty spanning 20 academic divisions, UCSC’s vision of “academic planning” falls short of anything innovative as it fails to address some blatant issues within the classroom — overcrowding, understaffing, lack of diversity and lack of engagement. In April 2014, the United Auto Workers Local 2865 (UAW 2865), which represents 450 teaching assistants and 12,000 other teaching assistants UC-wide, went on a two-day strike to protest growing class sizes and unfair labor practices. The UAW 2865 has since settled, but the problems continue. The university is poised to implement the plans within Envision UCSC in the spring with one of the main objectives in “academic planning” being to bridge teaching and research, but the bridge isn’t being built. The plan states that “through integrated campus initiatives and challenges” the university will “encourage innovative research, new programmatic contents and novel pedagogical methods in integrated research-curricular ‘centers of excellence,’” but the meaning behind the words dissipate in the absence of a more thoughtful plan. Rather than focusing on adequate class sizes or the “pedagogical mission” of the university, the Envision UCSC “concept paper,” which is mainly related to “research infrastructure” and “academic planning,” reveals a prioritization of research. The concept paper says “public discourse about the university sometimes pits research and teaching against each other,” and the public discourse is not entirely wrong in its assertions. A clear line is drawn between research and teaching, and UCSC stands proudly by its identity as a “pre-eminent public research university,” while pushing to drop the prefix. UCSC’s website proclaims the university is “Ranked #1 in the world for research influence,” meaning UCSC’s researchers are cited at a high rate per capita. However, there is no mention that for the 2013-14 year, UCSC ranks 136 out of 400 of the world’s ranking for teaching, according to Times Higher Education’s World University Rankings. UCSC’s goal should be to create more dynamic classrooms, hire innovative instructors and promote leadership, rather than solely focusing on research. The current structure of the classroom does little to engage students, as the teacher talks and the student absorbs. If the university is committed to creating a classroom centered around students and not lectures, a student could be an active contributor in their own development as a scholar. While Envision UCSC, under “academic planning,” aims to diversify faculty, maximize the effect of faculty hires, advance academic goals and prioritize research focus, graduate growth and curricular needs, the dedication to these goals pales in comparison to the university’s emphasis on research. Not only is teaching important, so is student engagement and development, faculty diversity, curricular growth and graduate growth. As of July 2014, the faculty is 2 percent African American, 61 percent white, 6 percent Latino, 9 percent Asian, 2 percent American Indian and 20 percent international, according to the Office for Diversity, Equity and Inclusion. While not all students get the opportunity to participate in research, the university does bring in more funds by continuing to strive to be first in the research world. However, only a portion of the population benefits from the university’s unwavering devotion to research. The concept paper says the university “wants to attract top senior researchers to campus,” but it has at times “lost these candidates due to the course load associated with the job.” With this perceived complication in place, the university is given a false dilemma where it must choose research or instruction, but the two can be pursued simultaneously. 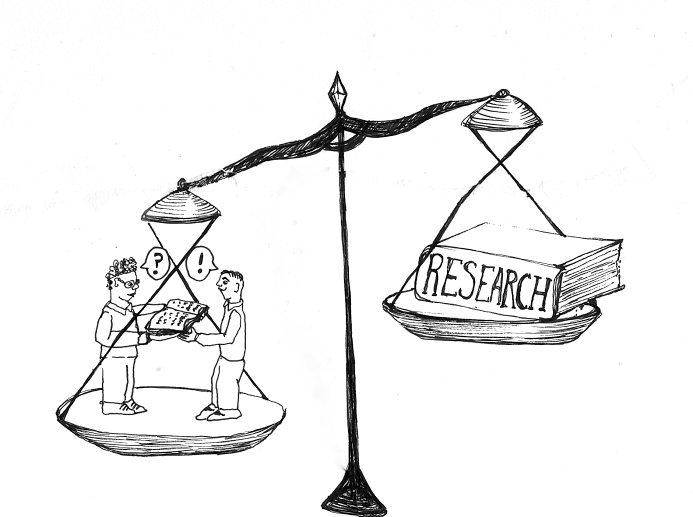 The notion that there is a conflict between research and teaching needs to be extinguished. Envision UCSC seems well-intentioned, but without a comprehensive plan to back up its aims, the intention won’t be enough to make any tangible change in the academic realm.